Oil price and its impact on Scotland’s Government revenues is a political football in the constitutional debate, therefore it demands in-depth analysis and not just political rhetoric. Business for Scotland’s research team has been asking previously unasked, yet vitally important questions on oil and gas revenues and how that affects Scotland’s fiscal position as part of the UK. 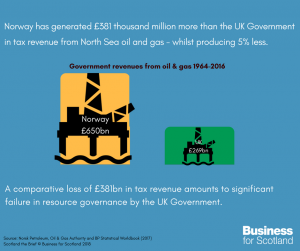 Norway generated £381 billion more than the UK Government in tax revenue from North Sea oil and gas between 1964 to 2016— whilst producing 4.7% less oil and gas. 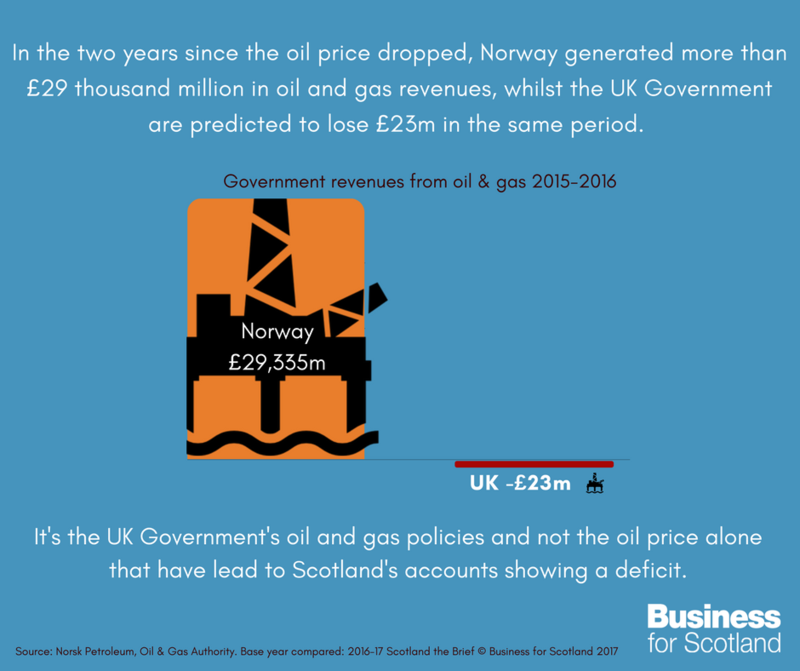 In the two years since the oil price dropped, Norway generated more than £29 billion in oil and gas revenues, whilst the UK Government are predicted to lose £23 million in the same period. Over the last two years since the oil price dropped, the UK’s taxpayers gave Shell £179 million in tax rebates, whilst Shell paid Norway £4.589 billion. UK taxpayers gave BP £342 million in tax rebates in the two years since the oil price dropped – Making the UK the only country out of the 23 countries where BP operates where they received money rather than paid taxes. The UK tax rebates were not specifically linked to any commitment to save jobs, and the UK sector seems to have shed significantly more jobs (120,000 since 2014) than the Norwegian sector (47,000 since 2013). The price of oil dropped significantly in the last two years, it is true. However, given the price has dropped by approximately 47%, why did UK revenues drop more than 100% and actually end up generating a loss? More to the point, given they had the same trading conditions, why did Norwegian revenues only drop 46% and still leave them generating massive revenues from oil and gas, when the UK Government is predicting to make a loss this year as tax breaks to the sector are deducted from revenues? 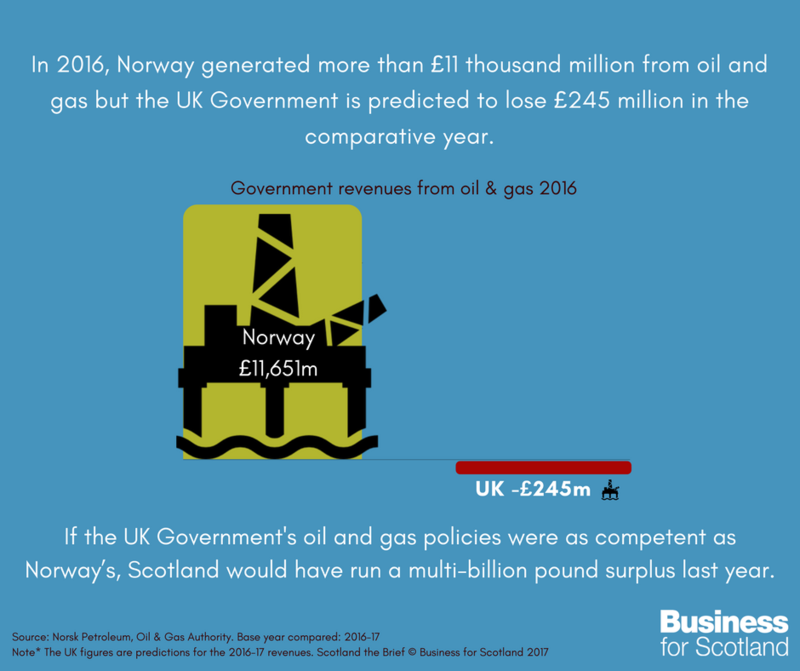 In the two years where official revenues have been declared since the oil price drop, the Norwegian government generated more than £29.33 billion in oil and gas revenues, whilst the UK government is predicting it will lose £22.8 million over the same period. The UK Government has introduced a tax system for oil and gas which effectively now pays large oil companies to extract oil rather than one where the oil companies pay extraction taxes to the UK. In response to falling oil prices, the UK Government decided to cut Petroleum Revenues Tax (PRT) in 2015 from 50% to 35%, and in 2016 it was further reduced to 0%. The supplementary charge was also cut from 62% to 50% to 10% during the same time. “Norway did not increase the tax rate when the oil price increased. Correspondingly, the petroleum tax was not reduced when prices fell. The Norwegian fiscal rule specifies that the transfers back to the state budget shall, over time, reflect the expected real return on the Fund. Thus, the Pension Fund Global shields the budget from oil price fluctuations. A decline in the price of oil therefore has no immediate impact on the fiscal stance”. So compared to the UK Government, the Norwegian Government’s approach to oil and gas resource governance has been extremely competent. They have avoided the need to cut Government spending in the face of falling oil prices, having protected their budget from oil price volatility through investing their sovereign wealth fund, and they are focused on channeling oil revenues to the benefit of the public good rather than offering large tax breaks to large oil companies. In the 24 countries where Shell operates, in the two years (2015 and 2016) reported since the price dropped, all except the UK made Shell pay taxes on oil and gas extraction. 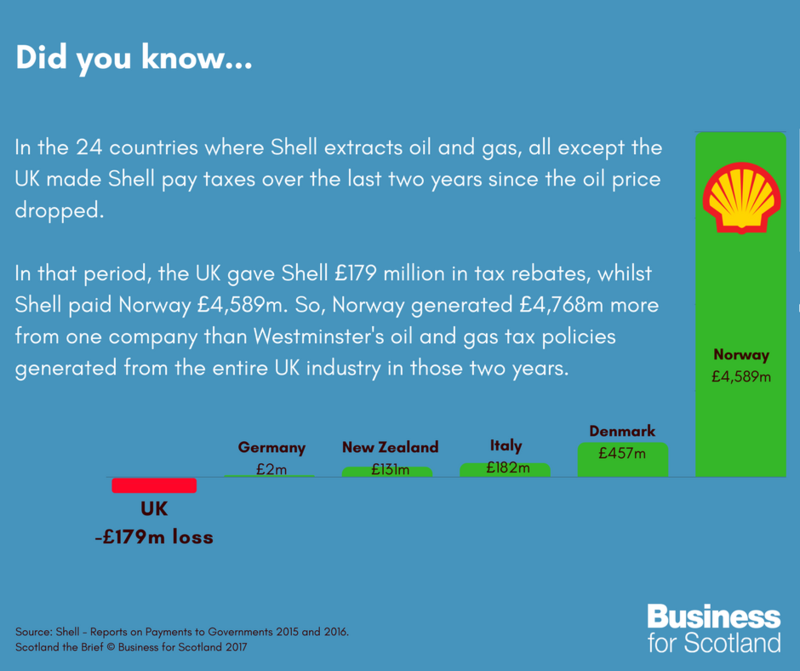 During that period the UK paid Shell £179m in tax rebates, whilst Shell paid £4.589 billion to Norway and even more to other countries. 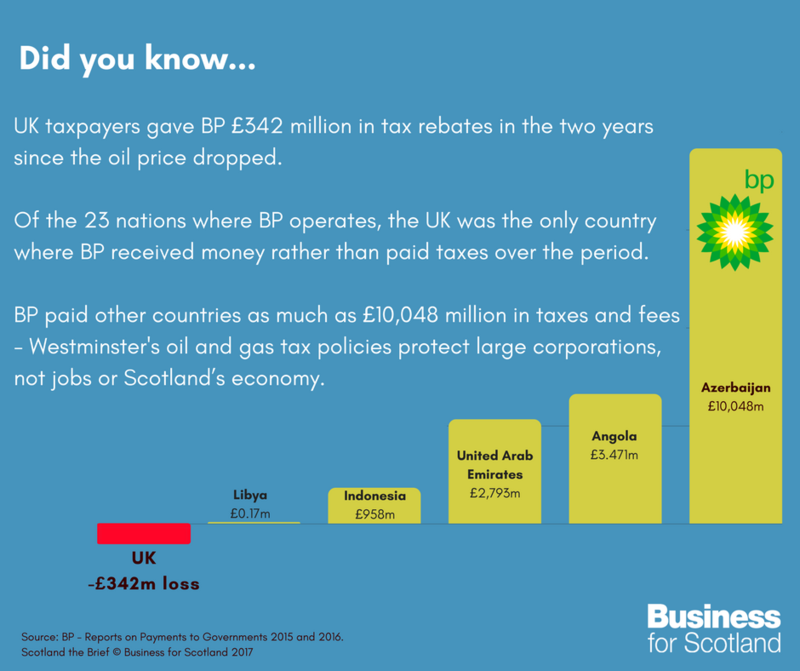 Likewise, UK taxpayers paid BP £340 million in tax rebates in 2015 and 2016. Other countries such as Azerbaijan received up to £10,048 million in taxes from BP. The lower oil price led to job losses in the oil and gas sector throughout the world, as would be expected. However, the UK tax rebates were not specifically linked to any commitment to save jobs, and the UK sector seems to have shed significantly more jobs than the Norwegian sector. So was the taxation cut that reduced North Sea revenues to below zero required to save the oil companies? In 2016, Shell (having benefited from tax rebates from the UK Government and having made many thousands of workers redundant) went on to declare the worlds largest shareholder profit dividend that year. Now in 2017, Shell has declared a £2,2254 million profit jump from quarter 1 in 2016 to quarter 1 in 2017. It is an observable fact that it is easier for a company to generate significantly more profit when you don’t pay extraction related taxes in one of your key operating theatres. In the past it has been the case that Norway’s approach has created a stable taxation and policy environment. Its use of Statiol, the State owned oil company, to invest in the sector has contributed to a significant production cost per barrel advantage for companies operating in Norway. Despite having produced 4% less oil overall since North Sea production began, in recent years Norway’s policy environment has helped the Norwegian sector produce almost double the oil of the UK, thus lowering production costs per barrel. The UK sector has, however, reacted to the price drop by cutting costs and cutting jobs, and some estimates of the average production cost fall in the UK sector suggest it has been around 45% since the drop in the oil price. Some of BP’s North Sea oil fields are operating at $12.00 a barrel and that is profitable at today’s $52.72 price. 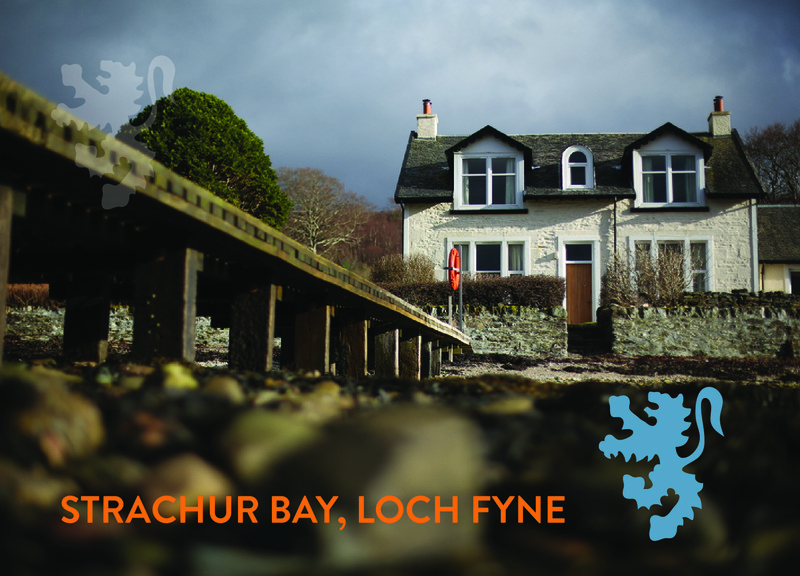 Looking back in history since oil was discovered in the North Sea in the 60s, the Norwegian Government’s policy approach has been able to generate £381 thousand million more in oil and gas revenues than the UK, having produced 4.7% less oil and gas over the period. It is a fact that the policy of reducing tax on oil companies’ operations has had a significant impact on Scotland’s national accounts, leading them to show a larger fiscal deficit than the rest of the UK. However, because the support to the large oil companies (whether necessary, advisable or otherwise) was managed through tax rebates it has effectively wiped out Scotland’s North Sea revenues, as 100% of the cost of a tax cut will be deducted from the Government Expenditure and Revenues Scotland report (GERS) statement. 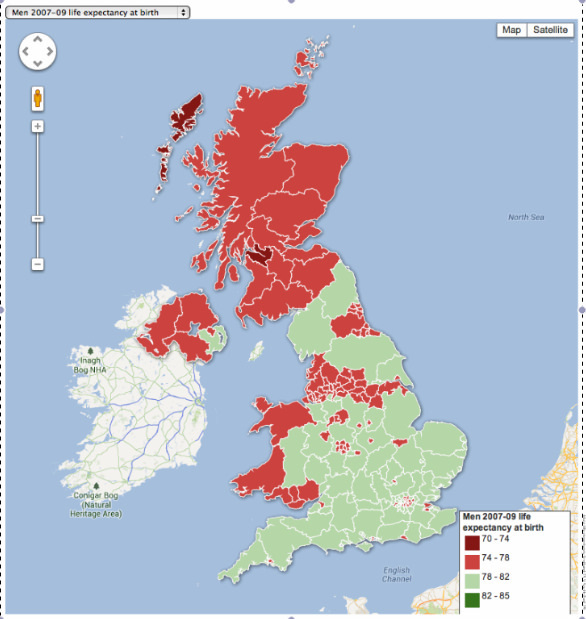 However, had the UK Government maintained tax levels but then offered grants from the treasury retrospectively for decommissioning and exploration, then only approximately 8.4% (a population percentage) of the costs of that grant support would have been deducted, and so with increased production it is possible that Scotland’s illustrative deficit as part of the UK would have been better than the rest of the UK. In accounting terms, if the UK Government lowers a revenue which is almost completely attributed to Scotland as a region of the UK, GERS will be assigned a major reduction in tax revenues. 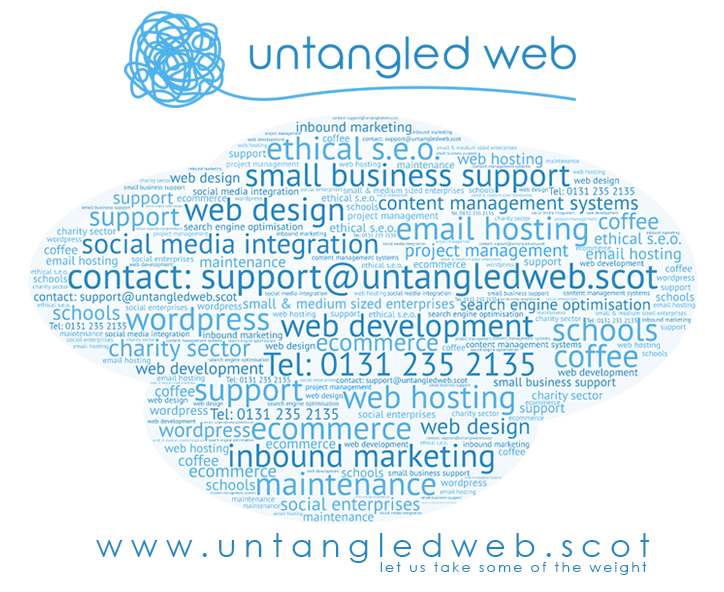 However, a cost can be allocated to GERS on an economic impact basis. Hs2 and the London Olympics set a precedent with GERS. Once it was confirmed that Hs2 wasn’t coming to Scotland, the GERS compilers refused to take a share of the costs onto Scotland’s books. They also refused the Treasury request to take a population percentage share of the costs of the London Olympics as an equivalent economic benefit was not coming to Scotland. Most of the decommissioning that generates the tax rebates which will turn GERS revenues negative will be carried out outside Scotland, and so Scotland is effectively paying 100% of the costs for decommissioning whilst getting possibly less than 20% of the benefit. This report may create some debate around whether or not this is a deliberate strategy on behalf of the UK Government to reduce Scottish Government attributed revenues for political gain in the constitutional debate. We have no evidence as to whether it is intentional or otherwise. We simply observe the fact that it will reduce Scotland’s revenues and that with the oil companies now making larger profits than before the oil price crash, it must now be a matter of urgency to consider if the tax rebates and reductions can be phased out. We believe that the evidence gathered in this research briefing demonstrates a long-term mismanagement of Scotland’s oil and gas sector resultant from Westminster Government policy. 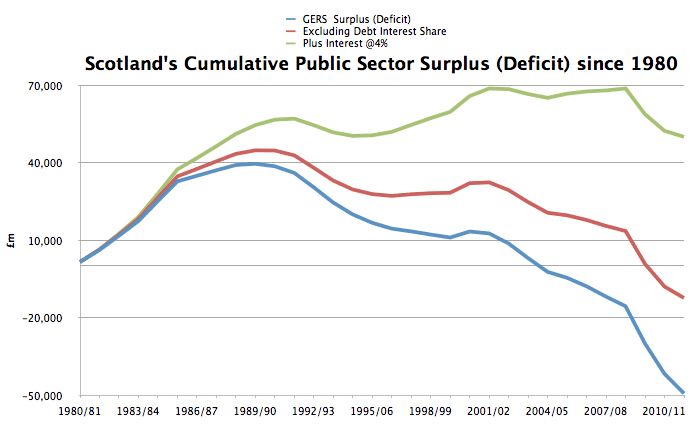 Without said Westminster’s mismanagement of Scotland’s oil and gas, Scotland would run a significant fiscal surplus. It is the UK Government’s policies that have created Scotland’s deficit and they have protected big corporations’ profits and their shareholders’ dividends, whilst failing to adequately protect North Sea workers who have lost their jobs. The GERS figures due to be reported on Wednesday probably show Scotland as part of the UK running a bigger deficit that the rest of the UK. Understandable, since the UK Government policy has removed one of Scotland’s key revenue streams. However, GERS will also show that despite this and the lower oil price, Scotland’s economy will still have grown year on year, thus proving emphatically that Scotland’s economy is remarkably resilient and resistant to oil price volatility. GERS, therefore, demonstrates the core strengths of Scotland’s economy and the weakness in revenues caused by being subject to UK Government policy. 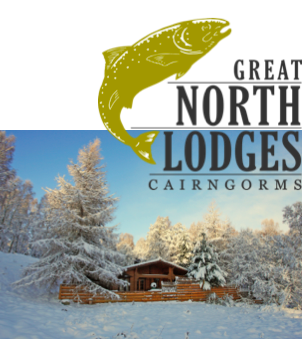 With Scotland’s GERS figures published this week, if you want to draw a conclusion on independence from GERS it would not be unreasonable to add Norway’s £11bn revenues to state that would have been possible as an independent nation with similar levels of resource governance to Norway. However, making detailed statements about the incomes and expenditures of an independent, or even a federal, Scotland would require a full set of policies that can be modeled to create an illustrative set of accounts. Until the Scottish Government (for independence) or the Scottish Labour party (for federalism) provide such a manifesto, GERS will still be used as the most authoritative pointer by all three sides in the constitutional debate, despite the fact that it only shows that Scotland as part of the UK, and with limited economic policy powers, runs a deficit that is significantly enlarged by oil sector mismanagement and challengeable accounting practices. Business for Scotland calls on the Scottish Government to organise a conference on the North Sea to bring together best practices from Norway and the UK in order to plan how we utilise Aberdeen and the North East’s expertise and transform that economic area into a global centre of excellence in renewable energy that will never run out. Prof. Michael Danson MA (Hons) (Aberdeen) DLitt (UWS), AcSS, FIED, FeRSA Professor of Enterprise Policy, Heriot Watt University Edinburgh. Did the U.K. Miss Out on £400 Billion Worth of Oil Revenue? https://resourcegovernance.org/blog/did-uk-miss-out-£400-billion-worth-oil-revenue – Note: The Natural Resource Governance Institute is a globally renowned economics think tank. In this research, they point out that Norway had an advantage over the UK in terms of revenues generated in each country’s oil and gas sector. 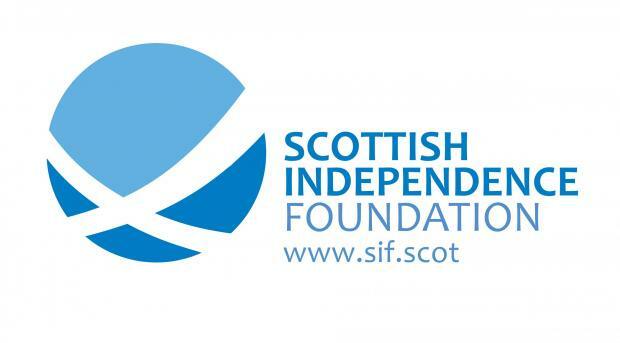 Upon investigation and replication of their methodology, Business for Scotland noticed that their figures were slightly higher than they should be. Business for Scotland are not criticising their work as this is a complex economic analysis, they were correct in their conclusions, if a little out on their numbers. 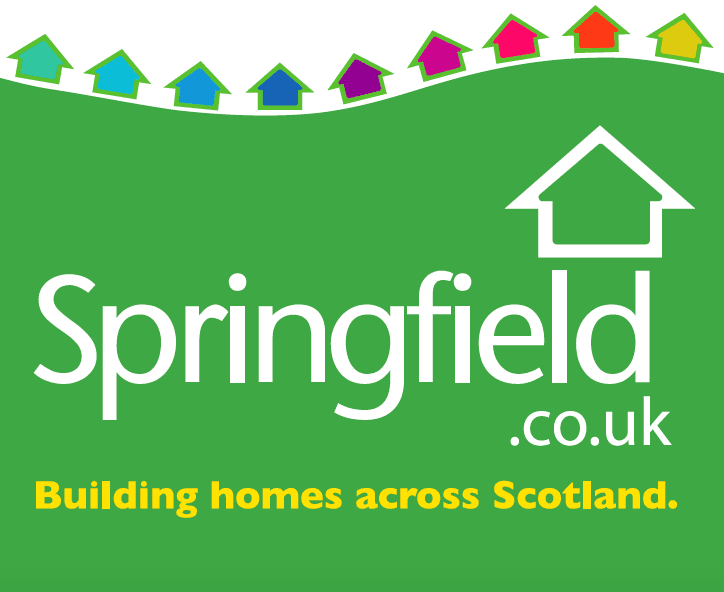 A very interesting and long overdue report that’s yet another nail in the coffin of UK PLC. Just a couple of questions Gordon. In Summary of Findings, para 3. In the past two years Shell paid Norway £4,589B. 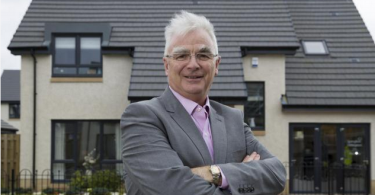 Should that not be £4,589m? I also tend to support the possibility that the UK Government is pursuing a policy that intentionally diminishes Scotland’s revenues. It would be useful to have your comments on “Unknown Territories” that seems to back up that view.